The temperature has significantly dropped over the past week or so and our family days out at the weekends have required layering up to keep ourselves warm. 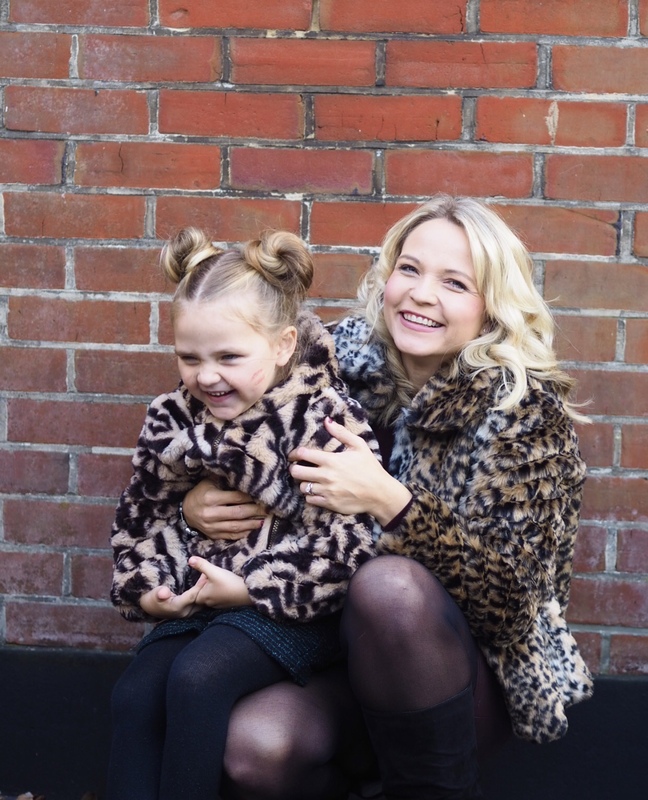 When Debenhams got in touch with me to ask if I would like to collaborate with them on their mini-me outerwear campaign I was really excited as it meant a lovely warm winter coat to wrap myself up in plus it was the perfect excuse to ‘twin’ with my daughter Carly who’s just turned six. Mini-me outerwear is available in Debenhams stores and online and includes a selection of gorgeous styles ranging from faux fur to biker jackets, all of which can be matched with similar versions from womenswear. I let Carly choose which coat she liked best and she opted for the animal print. The girls version is priced at £40 whilst the women’s is £65 and both come in this season’s classic leopard print. The coats arrived last weekend just in time for our family day out. As soon as I put mine on I was impressed with how nice and warm it was. The faux fur material provides total comfort whilst the leopard print is stylish and a brilliant statement piece. We went for a long walk down by the seafront and into the Christmas Tree Wonderland in Bournemouth. It was really chilly out but Carly and I were warm and cosy in our coats. I love that the styles are slightly different whilst being similar. Carly’s has a hood, which is brilliant for those days when the cold wind is nipping. It also zips up, whilst mine has hook and eye fastenings and looks good done up or worn loose for a night out. Plus it has nice deep pockets, perfect for stashing my phone and a favourite lipstick. Carly absolutely loves having matching coats. It’s not often we wear similar outfits but the coats look brilliant together and she’s enjoying being called mummy’s mini me when we are out in our coats together. She’s really looking forward to showing her coat off at school, where she’s sure to stand out in a sea of navy and black jackets. We are heading to Disneyland over the Christmas holidays and I know these coats will come in useful as the temperatures in Paris in December can dip really low. Paired with black gloves, scarves and bobble hats, we will be toasty and warm whilst walking around the parks. These coats, along with other styles, are available to buy from Debenhams. This is a collaborative post with Debenhams, however all words and images are my own.